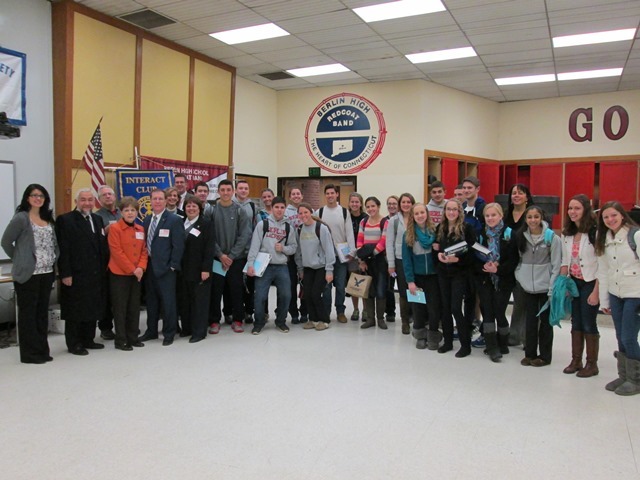 The Kensington-Berlin Sunrise Club visited the Berlin High Interact Club right before Thanksgiving to thank them for all they have done since being chartered in April of 2012. Interact members were treated to breakfast by the Rotary Club. The Rotary members were very proud of all the good work they are doing in the community and internationally. Membership the newly formed club has skyrocketed with now over 120 members. Internationally, Interact has raised money for two Shelter boxes & supported End Polio Now with a monetary donation. They have done numerous community service projects, including the New Britain Salvation Out of the Cold Luncheons, Hungerford Nature Center, Race in the Park and Relay for Life. Interact and members of the Kensington-Berlin Rotary Club along with the New Britain-Berlin Rotary will be teaming up to Ring the Bell for the Salvation Army on the upcoming Saturdays at the Berlin Stop & Shop.